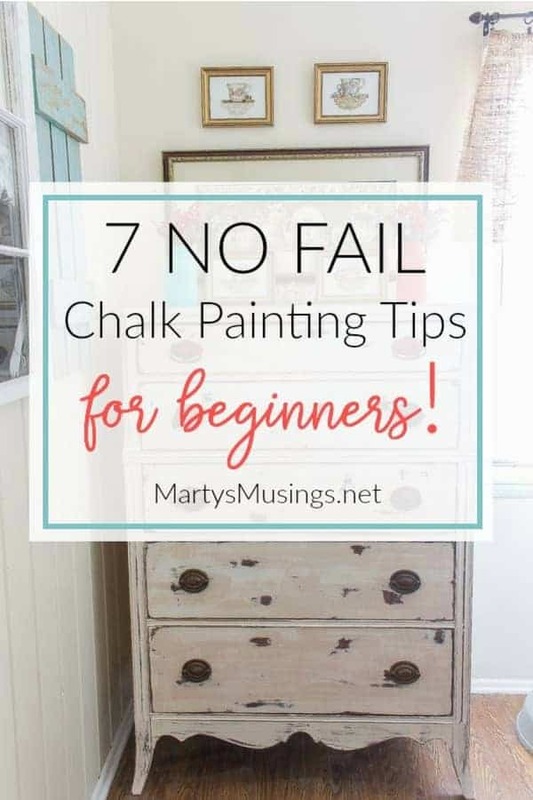 These 7 no fail chalk painting tips for beginners prove that anyone can learn to paint and are guaranteed to get you hooked on the latest craze and fun way to paint furniture and home decor accessories! True confession here. If you aren’t familiar with my blog you may not know one simple truth: I’m not a painter. My husband is the painter extraordinaire at Marty’s Musings. He’s a painting contractor by trade, but there’s one kind of painting that I AM an expert at. Chalk painting. You know why? You really can’t go wrong. Yep. My kind of painting! This past weekend Amy at Atta Girl Says and I helped several ladies at the Becoming Conference (hosted by Jen at Balancing Beauty and Bedlam) experiment and learn how easy it is to chalk paint furniture and accessories. Since the workshop was so successful I thought I’d share Tim’s and my favorite chalk painting tips for beginners, because that’s what I am. I always tell him to write like he’s talking to me! 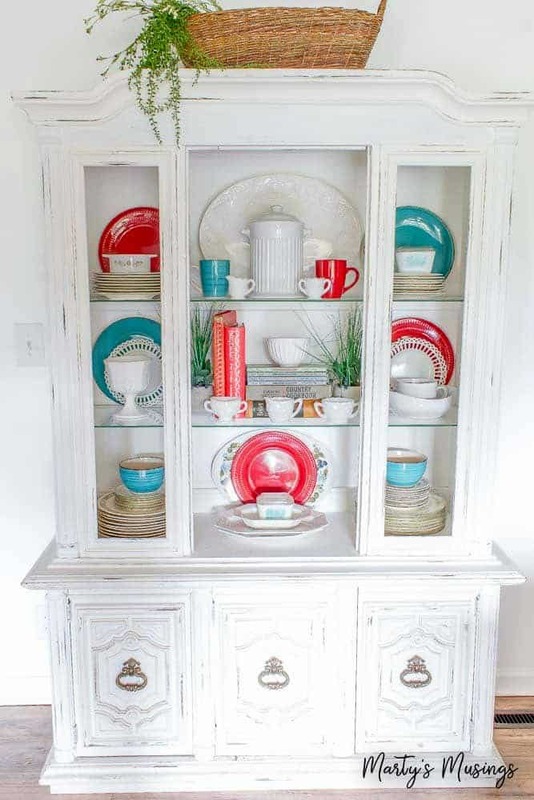 From Tim: If you’ve even had a brush with Pinterest, you have probably come across a few (million) pictures of people painting furniture with chalk paint. While it may take a few minutes to release old thoughts of that incredibly labor-intensive process locked in your brain, chalk painting is a truly liberating and transformational experience. 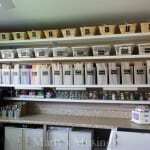 I have been a professional residential and commercial Painting Contractor for almost 25 years and have seen a lot of products, techniques, and fads come and go…some of them with good reason! I want to ease your mind and share some chalk painting tips for beginners and answer a few questions, as well as discuss the pros and cons of the process. So, here we go! These are our favorite products and ones that are affordable. 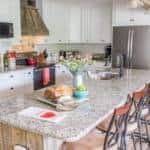 There are many more available on the market today but these will get you started! Chalk Paint: there are many different types available now. Annie Sloan chalk paint was the first one we ever tried, is a great product but it’s also more expensive. Ultra Matte Varnish (also like polyurethane but with a flat finish) I’ve never used this product but I would definitely try it. ***If you want to learn more about each of these steps below, the individual projects contain step by step instructions. Perhaps THE single most beneficial aspect of chalk painting furniture is that it requires almost no prep work and no priming. YES! 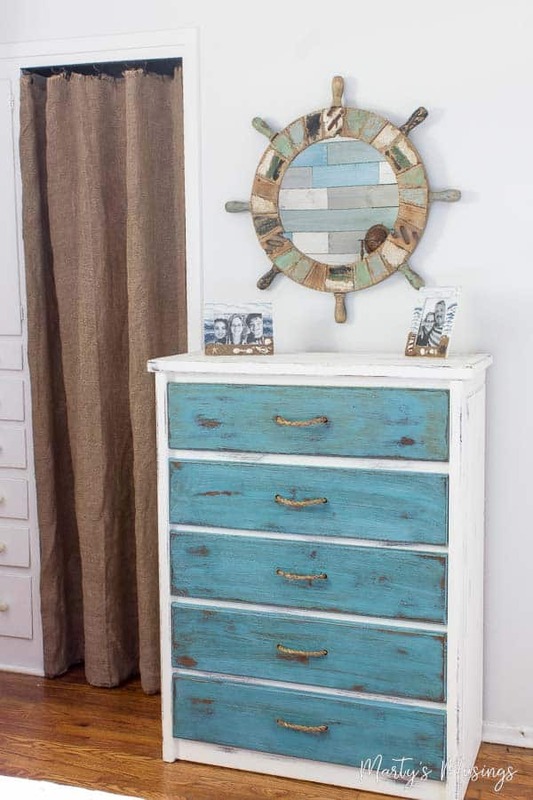 Whether you have a dilapidated old dresser from high school (which I did! 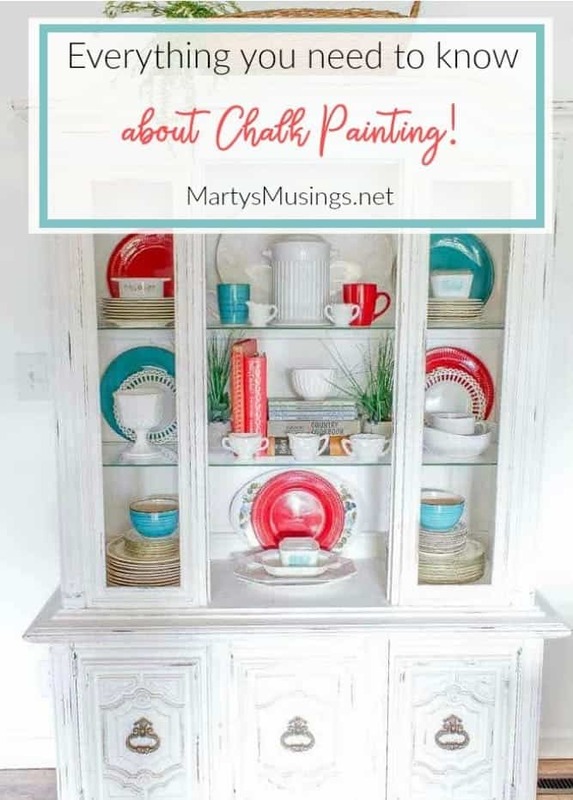 ), that glossy walnut end table, or your Mom’s glass-doored hutch from the ‘70’s, chalk paint can bring it back to life – or hide a multitude of sins! You simply remove any hardware you don’t want painted and go for it. My wife says one of her favorite chalk painting tips is that you don’t have to be a perfect painter to do this. In fact, you are SUPPOSED to do criss-cross brush strokes and not straight lines. I really took issue with this at first. If you are finishing the piece by distressing it with sandpaper, the irregular and imperfect surface actually helps that look. The only thing to really avoid is drips and runs. While chalk paint can be unbelievably expensive there are less costly brands to choose from more recently. 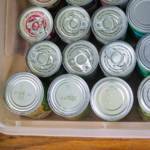 Plus virtually anything can be covered with just two coats. Since you don’t have to prime, it isn’t as big a pill to swallow. Be sure to plan accordingly and buy enough for the entire project. You may hit the bottom of that quart late Saturday night with no rescue available! You may also be more limited in color choices with chalk paint, but a good range is available in most areas. You can also research making your own “chalky paint”, but most folks have better results with an established manufacturer. (This is one of the least expensive brands and one I’ve used often.) And, honestly, I still don’t know where or how this stuff got its name! Tip #4 Should You Wax or Not? The most difficult part of this process is, by far, waxing. There is no “easy” way to do it and it is a step you don’t want to skip. You will have to decide whether you want a clear wax or a dark wax (golden brown or deep brown.) Clear will seal the piece almost invisibly, depending upon the color of the paint. Dark will have a more significant impact on both color and appearance. The dark wax really accents the dimensionality of the piece, as it will collect in crevices, corners, and any decorative accents. The easiest way to apply is, forgive me, wax on – wax off! Apply with a soft cloth and remove with another soft cloth. If you are distressing your piece, do so before you wax. You can buy a brush specifically made for chalk painting or easily buy a less expensive one. Remember, we’re not necessarily going for pretty here, just good coverage. Additionally, don’t use a natural bristle brush intended for oil-based paints and stains. Chalk paint is a water-based medium and will require a soap and water clean up. Exposing this brush to water will ruin it and you will have wasted your money on a very expensive brush. A decent 2” or 2-1/2” latex brush will do the trick. Let’s talk about distressing. While this step is certainly not necessary and may not work with your décor, it is a very popular partner to chalk paint. The key is to distress naturally; that is, think about the areas where a piece would naturally wear over many years and remove paint there. Typically, this is around handles or knobs, corners and along edges, and random spots here and there. Don’t distress as if the piece fell off the back of a truck going down the highway. Distress as though your piece enjoyed many happy generations sitting in the corner! A popular tip is to apply Vaseline on any spot where you know distressing will take place. The chalk paint will not bond here and it will be much easier to sand it off. The problem? You have to plan in advance where those spots will be! We have been a bit more spontaneous with distressing. 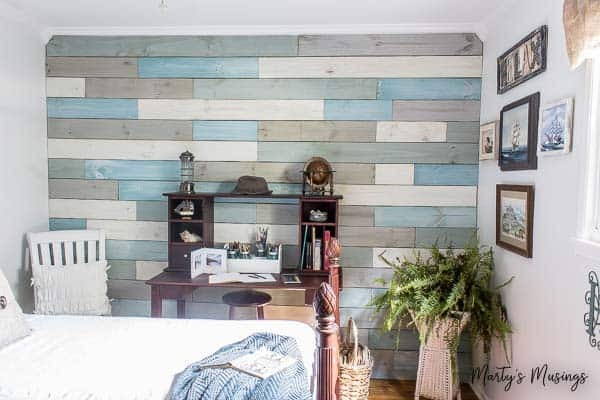 Probably one of our most unusual projects yet is the DIY plank wall in our coastal bedroom. Yes, we chalk painted it but you’ll just have to read the tutorial for all the details! 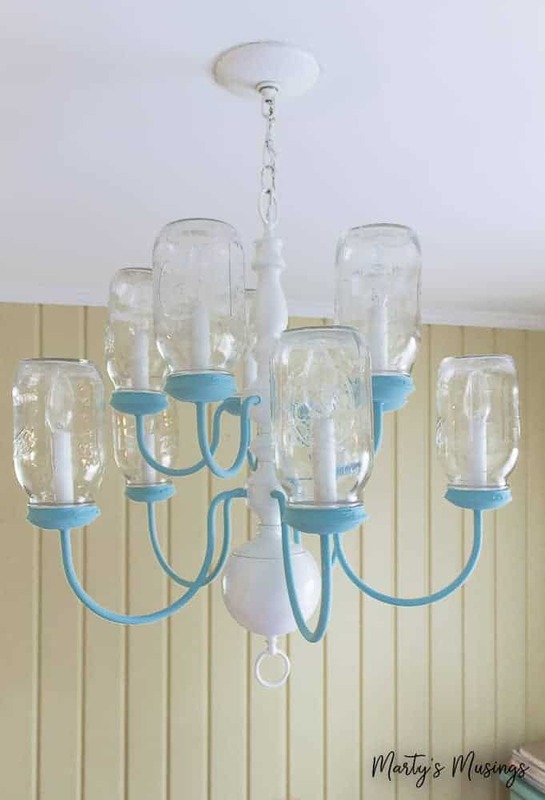 Yes, you can even paint a chandelier with chalk paint! Although our kitchen has evolved tremendously since this picture, I still love this project! In closing, let me note that there is considerable debate on the many other areas chalk paint can or should be used. I would hesitate to ever use it on a piece of furniture that lives outside. It simply is not formulated to withstand all that abuse and exposure. Some have had success with chalk painting kitchen cabinets. I have not experimented with that use, but my experience makes me think something far more durable would be preferred. I would also hesitate to use it on a dining room or kitchen table. These are such high traffic areas and, like the cabinets, need a more durable coating. Chalk paint is also not recommended for metal or plastic surfaces. 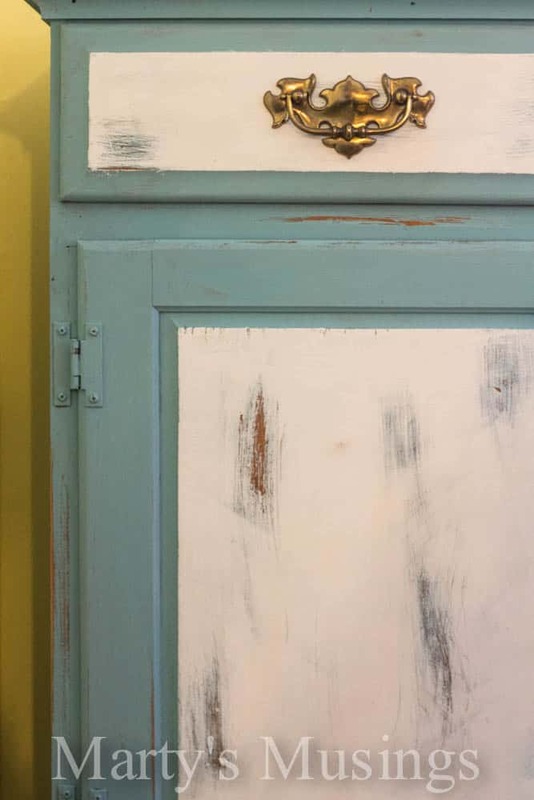 Gone are the days of that gross multiple step process from the 1970’s to paint Granny’s sewing machine cabinet! Forget that smelly step using an oil-based primer. Grab a quart or two of chalk paint, some wax, and transform your world. It is amazing what painted furniture can do for a space, great or small! Marty here: Now I’m a little different than my professional painter husband. I’ll try chalk paint on anything, especially if it’s small and didn’t cost much! Most of the items I paint are home decor accessories that I’ll probably swap out or mix and match somewhere else in the house. I did paint the table in the picture below, which was found on the side of the road. Love! I may just end up chalk painting the whole house! 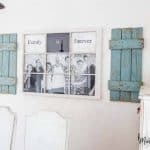 I have learned recently that there is a clear varnish that you can apply over chalk paint that will seal it so that the furniture can be used outside. I’m eager to try this out for myself! What do you think of these chalk painting tips and do you have any to add? ***There are TONS of helpful tips from readers in the comments below and answers to questions. Check them out! Hi, there. It really depends on whether you want to distress or not and what you want to show underneath. If you just want a smooth finish it’s fine to go without priming, depending on what color you are using. The same goes with the melamine. You might want to check out the comment section on this post. Tons of readers have asked questions similar to yours and you might find more helpful tips there. Good luck! I’m going to paint a curio cabinet black with a chalk paint. The cabinet has some kind of covering that would remind me of contact paper on the bottom and top. It’s peeling in places should I pull that off and then do the chalk paint? And should I use a clear wax or a dark wax with that? Hi, Betty. By the bottom and top do you mean places that that will be seen? Is the curio cabinet wood or laminate/press board? I think it would be fine to pull off the paper carefully, especially if the cabinet is wood. If the area is going to be seen you may need to sand it afterwards to get a smooth surface, especially if you can’t get all of it off. The other question is whether you’re going to distress after you paint it. If you do, whatever is underneath will show through if you leave the paper on. Just some thoughts! As far as wax, a dark wax always makes the paint darker and clear just seals the paint so the choice is up to you. Hello! On the top of this page where you list the items needed for this project, Light Satin Varnish is listed. However, I’m not clear where/how this varnish ought to be used. I appreciate any guidance you can offer. Hi, Amita. Light Satin Varnish is used with a project that is going to see a lot of use, such as a table. You would go through the regular process by applying chalk paint, distressing (if desired) and wiping down with a clean cloth. Then you would go ahead and seal it with the varnish at this point. You don’t need to wax it since the varnish IS the sealant. Hope this helps. Hi! 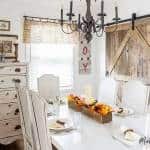 just found your blog while trying to learn if I can change my black picture frames in my house to lighter, more distressed/farmhouse type look. Will you see the black thru the color if I distress it? Is that what happens? Hi, Christy. 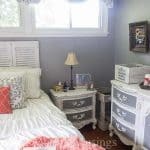 When you chalk paint over black, that is the color that will show through unless it’s just a finish and you can distress deeper to a lighter color. If it’s a finish you could just sand off the black and chalk paint over the bare wood, but that may be more work than you want to do. Hope this helps! Hi, Elizabeth. 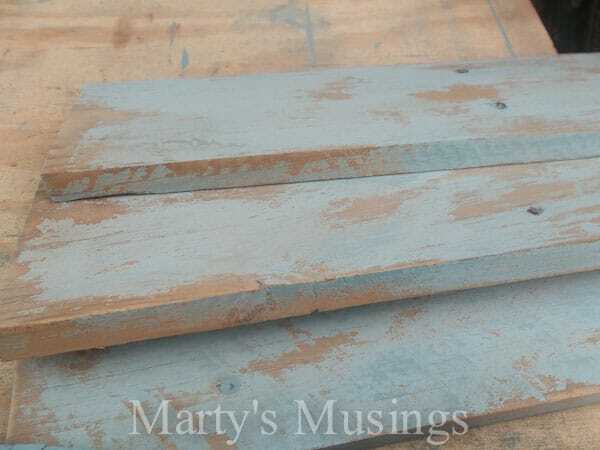 Glad you’re enjoying my blog and kudos to you for making your own chalk paint! Have a blessed day! I’m not entirely sure I bought the correct paint from hobby lobby tonight…my cans read “Americana decor chalky finish chalk acrylic” which is slightly different wording than your pictures and the amazon link. Please advise, I’d greatly appreciate it! Thank you in advance. Hi, Lynn. I looked on DecoArt’s website and I don’t see any new versions of chalk paint out with acrylic in it. Here’s that page: https://decoart.com/americana-decor/chalky-finish/paint But I did look up Hobby Lobby and saw the paint you got. It has the exact description on the Hobby Lobby site as the regular chalky paint so you should be good to go. Maybe DecoArt is rebranding their paint or Hobby Lobby just has some that is specific to their store? I don’t know but good luck with your project! I just found this page and started reading, very interesting. My question to you is, can “chalk paint” be sprayed through an airbrush/gun? Can it be thinned for spraying? The reason I ask, my brother and sister-in-law have some furniture that they would like to have chalk painted ans since I have spray gun equipment they thought about asking me to do the job. I have never used this type of paint before. Is it a mineral based paint, and if so is there a thinner that can be used with it? I did see in another question to you that there is “acrylic” chalk paint which I wold prefer to use. Can this be thinned? Reading the Q&A was quite enlightening and informative. Hi, David. Here’s my husband’s response: Chalk paint is a clay-based medium that has fairly large particulates, making it more difficult to spray. While I have never sprayed it, I would assume that you would need a spray tip with a large opening, high pressure and even possibly thinning the paint with water. I can only suggest sampling it first and tweaking as necessary. Great question! 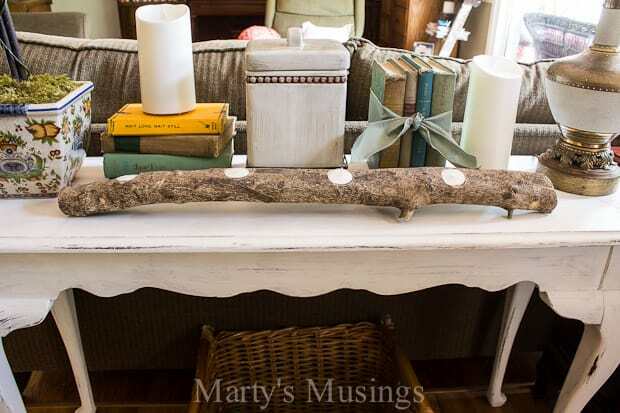 Marty here: There are also spray cans of chalk paint although I haven’t tried the product. Here’s an example: https://amzn.to/2vpSyos Hope this helps! 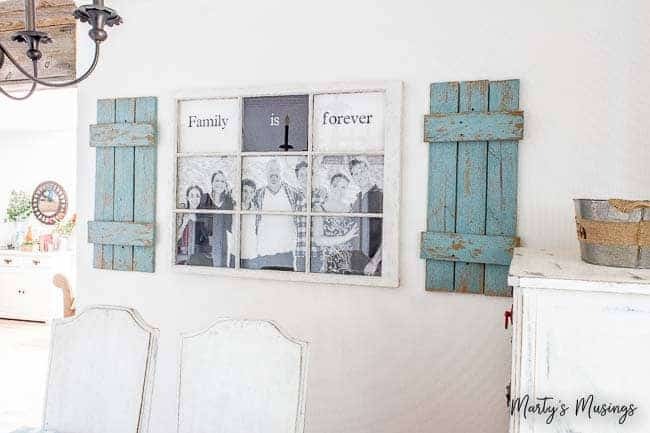 Using chalk paint is a great idea. I used it for my living room and bedroom. Hi, Trigger. It would be lovely if people could upload pictures but I don’t think that’s possible. Are you wanting to chalk paint the table and chairs? If you do my suggestion is to seal the table and chairs with the varnish listed in this post since I would guess they’ll get a lot of use. We also painted our kitchen table which you can read about in this post: https://www.martysmusings.net/2013/04/painted-kitchen-table-part-2.html Good luck! Hi, Melinda. It sounds like you only want to apply the dark satin to certain places. The purpose of the wax can be sealing (like the clear) or to add color and seal (like the dark satin). The dark satin is going to adhere wherever you apply it even if you wipe it back off. My suggestion would be to paint a section on the underneath of the piece and test it out there. That way if you don’t like it you haven’t ruined your entire chest. Hopes this helps! My new to me condo was built in the 80’s and I want to calk paint the bathroom vanities. They are real wood, but a very boring walnut color and I want a soft white (or even a light gray) color. Does chalk paint do well in a bathroom environment? Anything special of which I should be aware? Hi, Melodie. I think you’d be fine using chalk paint on bathroom vanity as long as you seal it with a varnish (like a polyurethane finish) made for chalk paint such as this light satin varnish: http://amzn.to/2wtM3Qm or this ultra matte varnish: https://amzn.to/2OPPtWG. This would be the final coat you put on top, so if you distress and wax, do that first before applying the varnish. Hope this helps! Hi, Margaret. You can certainly chalk paint over gloss painted window frames. Just remember if you’re going to distress them you’ll be sanding off whatever is underneath the chalk paint. So if you want to really remove the gloss paint as you distress you might need to use a heavy sandpaper or even lightly use a palm sander to remove the gloss. Or just leave it on. Totally your preference. Hopes this helps! I am wanting to redo my bathroom vanity. The walls are grey and the countertop is white. What color do you think would go well with these? Hi, Jill. That’s so interesting that you wrote! We are actually remodeling our bathroom and are painting the walls grey and are repurposing a dresser for the vanity. I’m going to chalk paint the “new” vanity walk with a dark wax on top. Or at least that’s the plan! It really depends on what style you’re going for but white is always a good neutral. There are also some pretty grey colors out there. Good luck! 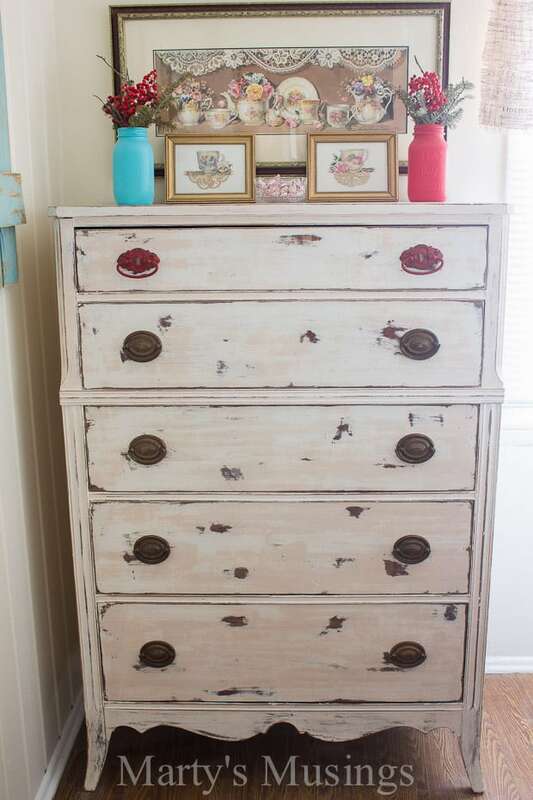 I am so happy that I found this article, I do have one question, I am going to paint a old dresser and I want to achieve a matte finish. Will the wax make it satin or glossy finish? Hi, Maura. I don’t feel like a regular wax makes the chalk paint appear glossy at all, especially if you buff it well. You can see some of the projects on my blog and judge for yourself. Hope this helps! Hi, Marcie. Absolutely! The satin varnish will help seal it. I highly recommend this for a high traffic area like a table. Hope this helps! Hello. I painted a curio cabinet over the weekend. I only waxed the shelves where I would be sitting things. I used white paint and white wax. However, the shelves are now a different color. Can I paint over the wax or do I have to remove the wax first? I want the colors to match. Thank you. Hi, DJ. You can absolutely paint over the wax. My recommendation is to wax the whole piece because the wax serves to protect your paint job. By white wax do you mean clear like this product: https://amzn.to/2JDVHsW If you’re using clear it shouldn’t change the color of the paint. Hope this helps! No. The lid said white wax. It is Waverly brand from Walmart. It actually pours out instead of being thick like what I see on painting posts. It wasn’t white when I opened it. A very light beige maybe. Since I’m new to this I just assumed it would turn white as it cured. It did not…lol. I guess I will ‘chalk’ it up to just my luck. I will repaint those shelves and use a good brand clear wax this time. Or maybe polyurethane. Thank you! Hi, DJ. I’m not familiar with that brand and haven’t tried any type of white wax before. Maybe it’s to give the wood a white washed look? I’m not really sure. Good luck with the rest of your project!